Film (Feature) Don't You Recognise Me? TV How Powerful Is Your Dream? Voiceover How Powerful Is Your Dream? Film (Short) Where Am I? Thank you for visiting my Mandy Profile Page. I am an Award Winning Actor, Award Nominated Film Producer and Published Writer. For many years I have treaded the boards in the classics, lived on the screen with the daring and created literary works from the depths of my soul. I have written a Novel, Short Stories, Screenplays, Monologues and Poetry. I hope you enjoy browsing through my work. My Film highlights include winning the "Best Performance Award" at the "Starburst International Film Festival 2016" in Manchester for playing the mentally challenged 'Damo' and his grief stricken twin brother 'Daz' in Jason Figgis revenge thriller, "Don't You Recognise Me?" I was also Associate Producer and Co-Editor on this acclaimed Film. I also recently portrayed the poacher 'Pence' in Randal Plunkett's mythical thriller "The Green Sea" which is currently in post production. I also recently played the terrifying creature, 'The Plastic Man' in Jason Figgis' mesmerising horror drama "Torment" which was nominated for numerous awards including "Best Film" at the "Starburst International Film Festival 2018." I also portrayed the real life historical figures, Joseph Plunkett and Major Ivor Price, in the "GPO Witness History Exhibition" 1916 Easter Rising Film which was directed by Luke Leslie. My other Film roles include the disturbingly obsessive husband 'The Uncommon Mr Goode' in the Feature Film "The 12 Slays Of Christmas" and the American Serial Killer 'Terence Lee Hall' in the Feature Film "Grindsploitation." These horror anthologies were produced by Body Bag Films, my segments were directed by Jason Figgis, and they were released on DVD in 2016. I also played the tough, unrelenting brute 'Tommy Byrne' in Figgis' crime drama "Urban Traffik" which had it's World Premiere at the "Underground Film Festival 2016" in Dublin. I also portrayed the charismatically haunting 3000 year old Greek vampire 'Acacius' in Jason Figgis' horror thriller, "The Ecstasy Of Isabel Mann" which is available on DVD and was nominated for numerous awards including "Best Independent Film" at the "Blood Guts UK Horror Awards 2014." 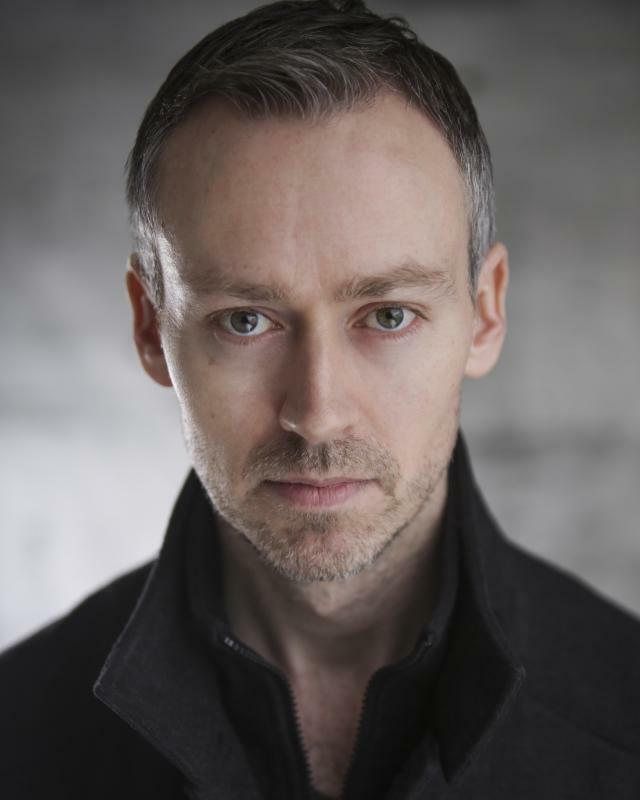 Before this I played the kind hearted doctor 'Dominic O'Sullivan' in Bernadette Manton's powerful drama "The Wake" which had its World Premiere at the "Boston Irish Film Festival" in March 2014 and is available on DVD. Another prominent role was the insanely animalistic parent 'Jack Purcell' in Jason Figgis' "Children Of A Darker Dawn" which was nominated for numerous awards including "Best Independent Horror Feature" at the "Blood Guts Film Awards 2012" and is also available on DVD. I previously played the heroic 'Crusader' in Ron Howard's Blockbuster Film, "The Da Vinci Code," and the charming salesman 'Rob Marshall' in Mark McAuley's Award Winning Short Film, "Connection." I was also Lead Actor, Writer and Producer on Barry Brennan's Double Award Nominated Short Film, "The Detective" which was shown in festivals throughout the world. My TV highlights include playing the 'Happy Man' in the "Costcutters Commercial" which was directed by John Gleeson and is currently screening on TV3. I previously played the courageous climber, 'Jeff' in Birbl's inspiring TV Pilot "How Powerful Is Your Dream?" which was directed by Jason Figgis. I also previously portrayed the Victorian English scoundrel 'Arthur Palmer' in Episode 2 of ITV's historical documentary "Martina Cole's Lady Killers" which was directed by Rebecca Cody. I also played the wildly funny self-proclaimed Method Auteur 'Stefan Archer' in Randal Plunkett's TV comedy pilot, "DysFunctional Fitness." My Theatre highlights include recently playing the historical figure, Patrick Pearse, in Monaghan Town Council's prestigious event "1916: Brought Back To Life" which was directed by Dave Swift. Other leading roles include the roguish charmer 'Robin Conway' in J.B. Priestley's "Time And The Conways," at the Draiocht Theatre, Dublin, which was directed by Ann Brophy, the sensitive teacher 'George' in Edward Albee's revered "Who's Afraid Of Virginia Woolf?" and the emotional powerhouse 'Boxer' in George Orwell's acclaimed "Animal Farm," which were both directed by Simon Hubbard at the New Theatre, Dublin. I previously portrayed the LA police detective 'Jeff Rabin' in the theatrical adaptation of the Oscar winning "The Usual Suspects," which was directed by Ricardo Pinto at the Derby Playhouse, Harlow Playhouse and Mercury Theatre. I also previously played the Boston soldier 'Robert Bailey' in Rikki Beadle-Blair's mesmerising Iraq based play "Touch" at the Tristan Bates Theatre in London's West End. Finally, if you are looking for an actor whose versatility is unlimited and whose passion and dedication to a craft that I love is unequalled, then please contact me as soon as you can and I promise that your effort will be returned a thousand fold with all the love, joy and heart that a real actor will bring to your project. Please phone me on (00353) removed or my Agent, Amazon Artists Management, on (0044) removed . Photograph by A P Wilding.